Ligustica, often referred to as the yellow bee are a very gentle strain and most beekeepers find them a pleasure to handle. They display a good hygienic behaviour and provided they have enough room within the hive they have a lower swarming tendency. 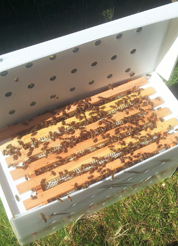 The queens are very prolific building up to big colonies early in the season. The Ligustica bees are super honey gatherers as well as being low propolis users which are ideal characteristics for hobbyist and commercial beekeepers alike. However, the Ligustica need notably more stores in preparation for winter, but with all that they need they over-winter extremely well.